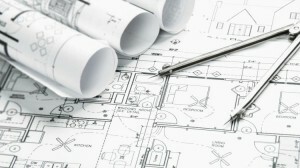 I am a long time AutoCAD user and started using Revit intensively in last few years. I always love their cool products, so it’s kind of heartbreaking to see how their service has become. It all started with the subscription plan. Autodesk stopped selling perpetual licenses and sell their product for a term based. Obviously, there is a market for a short-term based license. But it’s supposed to be an alternative. Not the only way to purchase Autodesk license. The licensing itself has a significant change, it’s now a named user license. Legally, no one may borrow your computer and use the Autodesk product that is assigned to you. Technically, assigning the licenses is troublesome and problematic. I lost count of how many times I failed to assign a license to a user smoothly. Mostly it needs several attempts and some time. And the worst is: Autodesk products now check the license regularly to Autodesk server. It should be fine. Unless now it becomes regular the server thinks you don’t have a license. Even if you do have an active subscription. I count at least four times it happened. 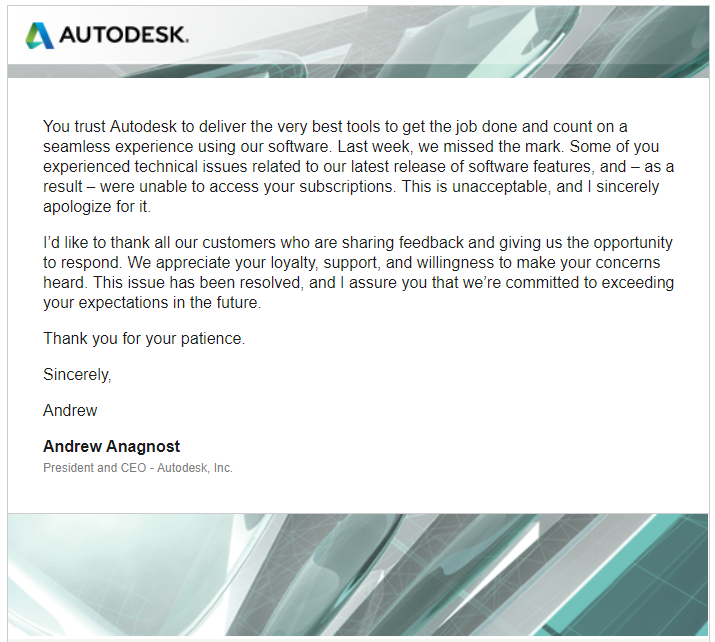 The most noticeable is when Andrew Anagnost sent emails to all subscription customers after the issue after AutoCAD 2019 was released. This email was sent on 28 March 2018. Andrew also apologized and promised it won’t happen again on his Twitter account. Again, sorry it happened and it won’t happen again. Glad the email got read! However, it took less than a month until the issue happened again. Steve covered it in his blog post here. This time, not only the license is accessible, the contract manager will have to reassign the license to their users. Imagine if they have many different products and dozens of users. That is a very bad day for the contract manager. The subscription plan itself made the customers unhappy. Now while Autodesk is trying to convince the customers that subscription plan is much better than perpetual license, this issue happened. Remember: it never happens with a perpetual license. People start to lose their trust to Autodesk. Imagine how much time they lost not able to use the software, how much work they put to solve the issue. The number of the customers who are looking for an alternative is increasing. If it becomes expensive, many big companies are fine with it. But not reliable? So yes, Autodesk is in trouble. People are losing trust to Autodesk. Actually Adobe is doing a much better job and their subscription is more realistic. Autodesk is way over charging for their products. Its a shame because if they made it like Adobe’s they would have millions of more users and Billions of more in revenue. I solved this problem – LEGALLY – and permanently, about 4 years ago, and haven’t looked back. Other than a brief note (which my clients can disable) I DEFY you to tell my work isn’t GENUINE AutoCAD. Bentley licensing itself is also as bad as Autodesk. If only Bentley offers the licensing like they did before 2005, they would get Autodesk customers easily. Demise of a great company always begins with greed.